Merry Christmas! Here’s a great anime-themed webcomic for all of you. Laserwolf here. Once again my curiosity has driven me to buy manga based on its cover. The truth is, I often wander manga sections and if something catches my eye I buy a copy there and then so that I don’t forget about it later. This is one of those where I was quite glad I bought it, and had to go out and get the next volume. Unfortunately there are only two volumes out, but I would like to read more. Ten years after the beginning of the Meiji Period in Japan, a wandering swordsman happens across a failing dojo. Despite the fact that he looks weak and doesn’t appear to like fighting, he is actually a superhumanly powerful swordsman. He now uses his sword to defend people and defeat every single opponent that comes his way. And that’s about it. Today’s English anime market is much different than the market of seven to ten years ago. Nowadays, two people can be anime otaku and never have seen the same shows, but before, if you found another anime fan, you could be sure that there were a few “classics” that they had seen. These included titles like Cowboy Bebop, Inuyasha, Trigun, Gundam Wing, Rurouni Kenshin, and a few others. However, I (Panda Masamune) was a little bit of a latecomer to the scene. I saw Gundam Wing when it aired on Cartoon Network, but I had to track down all of the rest when I became an anime fan in 2004. Some of the “classics” stood the test of time, and some didn’t. 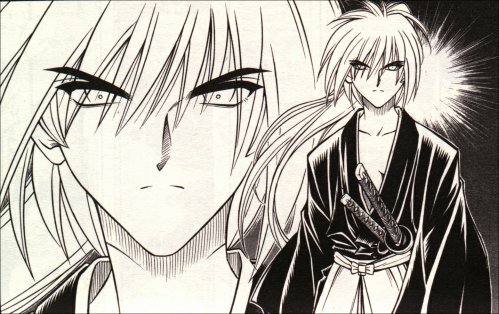 Today, I am going to review the first four manga volumes of Rurouni Kenshin—one of the titles that didn’t. Hello again. This is Laserwolf writing to tell you all about what has been consuming a lot of my time lately. A series I didn’t know anything about until I decided to judge it based on its covers (pretty pretty). Luckily for me, the inside of the manga was even better! A summer net-thriller movie whose most intriguing character is a 90-year-old woman who’s idea of ‘high-tech’ is a rotary phone. Panda Masamune here bringing you our first movie review. I came across Summer Wars through a review on Anime News Network and was intrigued by all of the good things that the reviewer said about it. So I picked up a copy and watched it, and I have to say that it deserves every good review that it gets. It is a social commentary packaged as a blockbuster, and it illustrates clearly how people who normally wouldn’t get along can combine their gifts to accomplish a lot when the time calls for it.